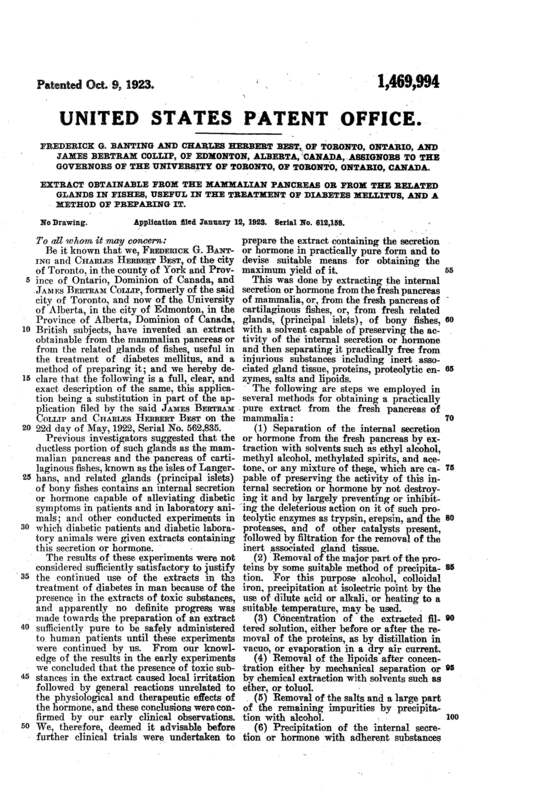 On October 9, 1923, Frederick Banting, Charles Best, and James Collip were granted the patent for “Extract Obtainable from the Mammalian Pancreas or from the Related Glands in Fishes, Useful in the Treatment of Diabetes Mellitus, and a Method of Preparing It” or Insulin, U.S Patent No. 1,469,994. Type 1 diabetes (T1D) is an autoimmune disease that occurs when a person does not produce enough, or any insulin. Without regulated insulin levels to maintain blood-glucose levels, serious health problems can arise. Before insulin was discovered, diabetes was considered a fatal disease. Typically, T1D is most commonly found in children and adolescents. Before the advancements of modern medicine, those diagnosed with T1D rarely lived a year after the diagnosis and suffered greatly; often with blindness, heart attacks, and kidney failure. Although it is debated who the original discoverers of insulin are, many believe it is orthopedic surgeon, Frederick G. Banting, Dr. Charles Herbert Best, and biochemist, James Bertram Collip. Dr. John Macleod, physiologist, is also credited with helping as he provided a laboratory, cow pancreases for testing purposes, and more. Dr. John Macleod was born in 1876 in Scotland. He studied medicine at Aberdeen University. Macleod did extensive research on diabetes and concluded that “impaired utilization of sugar was probably the major reason for hyperglycemia in diabetes.” He moved to Toronto and was a Professor of Physiology at the University of Toronto. This is where he met Banting. Dr. Frederick Banting was born in 1891 in Ontario, Canada. He studied medicine at the University of Toronto. He also served in the Canadian Army Medical Corps. He was wounded in the battle of Cambria and received the Military Cross for heroism under fire. Upon his return from the army, Banting practiced orthopedic medicine but continued to come back to diabetes research, something he had a deep interest in. Banting was determined to discover how to successfully extract insulin from the pancreas before it was destroyed by proteolytic enzymes. He went to Macleod, who provided facilities to work in and was introduced to Dr. Charles Best. Dr. Charles Herbert Best was born in 1899 in Maine. He enlisted in the Canadian Army in 1918. He returned from the army a year later and attended medical school at the University of Toronto. Best was meant to be a summer research assistant for Macleod, but Banting needed help with his experiments so Best became Banting’s assistant. Along with Best, Dr. James Bertram Collip was also an assistant to Banting. Dr. James Collip was born in 1892 in Ontario, Canada. He attended the University of Toronto at the age of 15 and received his doctorate in biochemistry by the age of 24. In April of 1921, he went to work with Macleod. In December of 1921, Banting and Best were having difficulties with their research so Macleod assigned Collip to work with them. 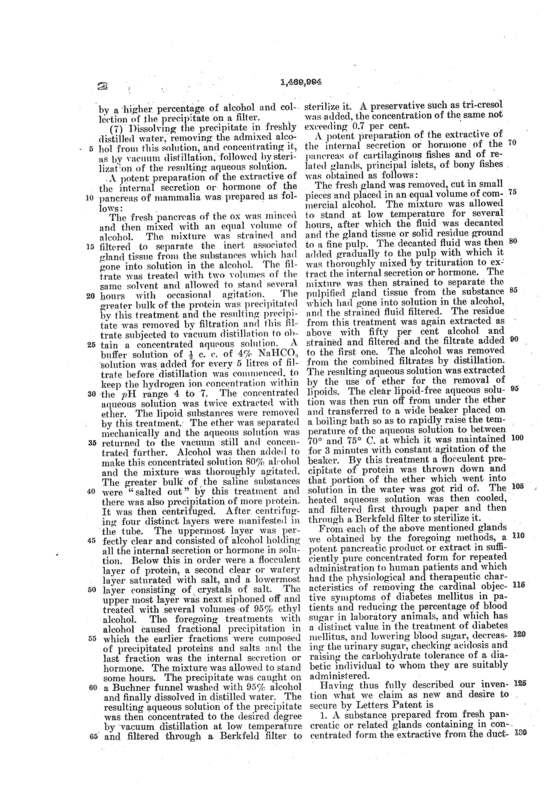 Collip’s contribution was to “prepare insulin in a more pure, usable form than Banting and Best had been able to achieve”. There had been many successful trials with animals, but the first success with a human was with 14-year-old Leonard Thompson. Thompson had type 1 diabetes and was near death when the trial began. 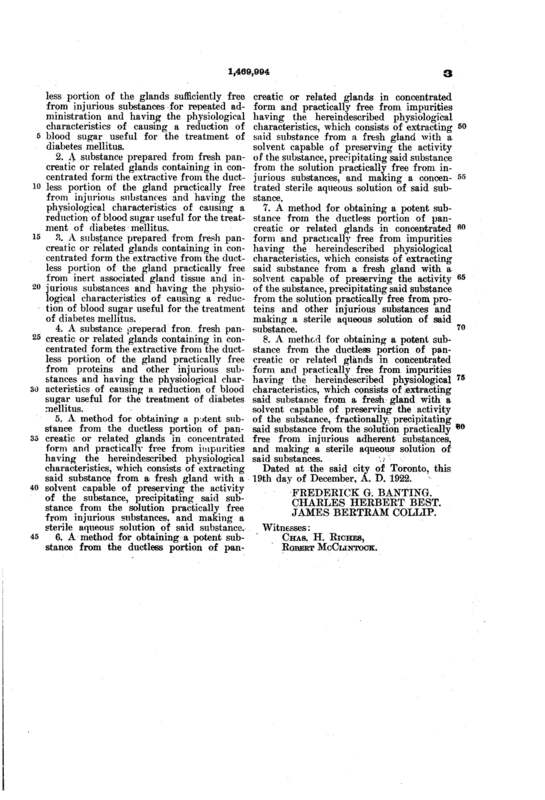 The first trial was unsuccessful but on the second attempt, when given the purer form, Thompson’s blood sugar levels decreased significantly and he regained his strength and appetite. After perfecting this method, they sold it to the University of Toronto for $1. They wanted insulin to be available to all of those who needed it. In 1923, Banting and Macleod were awarded the Nobel Prize in Physiology or Medicine. Banting did not agree with Macleod receiving the award as he felt his role was more supervisory and that Best should have been awarded instead. In the end, Banting shared his prize with Best and Macleod shared with Collip. Suiter Swantz IP is a full-service intellectual property law firm, based in Omaha, NE, serving all of Nebraska, Iowa, and South Dakota. If you have any intellectual property questions or need assistance with any patent, trademark, or copyright matters and would like to speak with one of our patent attorneys, please contact us.